If you’ve been following along since my most recent trip to London (in October), you’ll know that I’ve been hinting about going back on an extended visit ever since. I don’t want to give away too many details just yet, but I will be going back this fall! I’ll be escaping the worst of the Texas summer heat on July 26th and heading back to my favorite city until the holidays. I’ll be sharing more info as we get closer (and a bunch more travel content! ), but I’ll be making some changes on here that I wanted to update you on now. In an effort to *hopefully* grow my readership while I’m abroad (and maybe a little bit prior to my departure), I’m going to begin including links to both US and UK retailers in my blog posts. Just like before, you simply have to scroll down to the SHOP THE POST section of each blog post to find the links to the products featured. If you’re based in the states, just click the link titled “US” – you’ll find the products linked to your favorite trusted brands based here like Shopbop, Nordstrom, Neiman Marcus and more. For those of you based in the UK, you’ll find links to the same (sometimes exact and sometimes similar) products at the retailers you’ve come to trust at home (and ones in the US with good international shipping rates!) when you click on links titled “UK” – these retailers could include ASOS, Harrods, Selfridges, Shopbop, NET-A-PORTER, etc. If an item is not available at a British retailer, is old or sold out, I will link to the most similar pieces I can find! This sounds amazing! I love London so much. So happy it’s only a one hour flight from Germany! Great look, Merritt! That’s exciting, I bet it will be fun to escape for a while and I love this look. I adore this look from head to toe and that last photograph of you is absolutely stunning! Can’t wait to hear more about your trip – sounds amazing!! Wow! that is such awesome news about your extended stay in London. Congrats to you and I can’t wait to share the experience with you via The Style Scribe. This look is one of my favorites of yours ever. Every piece is perfection, and styled together they really make for a captivating look. You are gorgeous! That’s amazing! I lived in London for 3 months and I loved every minute of it. Such an amazing city. Cannot wait to hear more about this! Let’s catch up when you’re in NY next week.. so excited for you! Cutest shorts ever! So excited for your big trip! Love the mix of textures in this outfit and so excited about your new adventures. Can’t wait to hear more! Exciting news! Welcome back to London! This look is perfection and I couldn’t be more excited for your abroad adventure! I’ll be following closely & hopefully visiting!! Wonderful news, Merritt! I’ve been living here in London for the past couple of years, but many of my favorite style bloggers – like you! – are stateside, which can be very frustrating when I want to shop the posts. Dilemma: solved! What a great idea! On a side note – we grew up together (we were pretty young, so no worries if you don’t remember) & I’ve loved following your blog & its success through the past few years! It’s very inspiring to see a hometown gal launch herself like you have! I’m sure you have lots of plans for your time in London, but I’m here if you ever find yourself craving some Mexican food with a fellow Texan! Oh wow, I’ve never been to London! Love this jacket! How exciting for you! I can’t wait to hear more and follow along. You look GORGEOUS in this outfit. 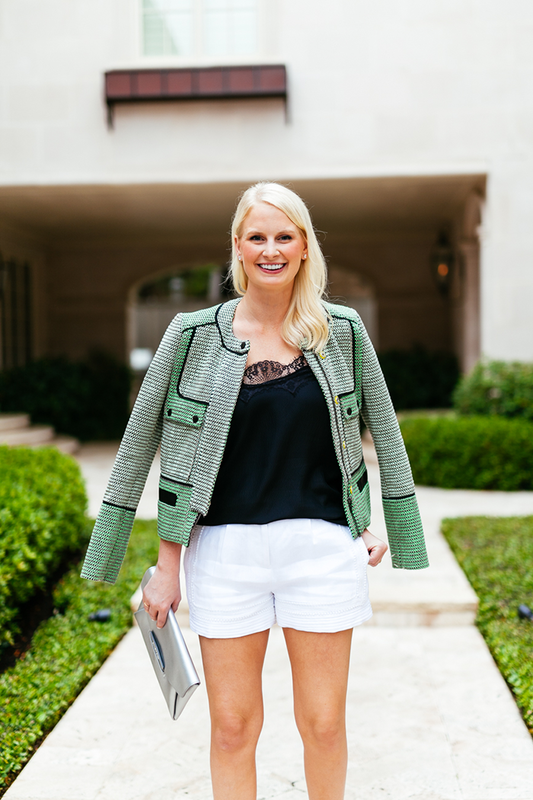 I love the white shorts paired with the green jacket. You’re looking thin lately! Eeeek, that’s so exciting Merritt!! Also, you are TINY. Maybe add some fitness posts in addition to your new travel posts?! How exciting!! So jealous of your upcoming travels! Love that green jacket on you! So gorg! Me too!! I’m heading there for 18 months or so, starting this summer – I would love to connect! Obsessed with that tank top! Also use the Oribe shampoo and LOVE it!!!! What?! You lucky lady! Can’t wait to follow along! Loving those shorts, BTW. :))) As you know, I’m thrilled for you. What a great statement jacket, you look beautiful. absolutely adore this outfit — every piece is so perfect. Can’t wait to hear more about your trip! WAIT that is SOO exciting! I need to go abroad again soon! Love the look! The coat is gorgoeus! WOW, what a beautiful jacket! I love the colors and your scalloped lace top is so dainty underneath it! That is so exciting! I’ve been wanting to get back to London : ) Can’t wait to read your travel posts! I love the details on those shorts, perfect for summer! Gorgeous shoes! I love the cami also. I’m praying that you have the best time while in London!